*I received a free copy of this book from the publisher in exchange for an honest review. Wow – what a book! I know I will be mentally processing this one for a while – thank heavens for Kindle highlighting. I did a lot of highlighting during the course of reading this book, not because the concepts were difficult to understand or follow but because they were so meaningful. 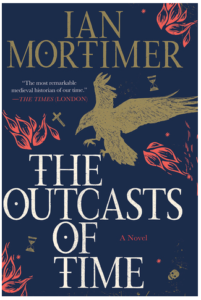 Ian Mortimer, as many know, is a wonderful historian, and he doesn’t disappoint with this work. The Outcasts of Time is indeed a work of fiction but is replete with very specific historical details; it runs through every element of the story. Although there is a ‘time travel’ in this story, I wouldn’t classify it is science-fiction or fantasy. The only ‘magical’ element is the fact that the main character is, as he puts it, ‘skipping across time like a stone across water’; all other elements of the story are realistic. The time travel element allows the author to delve into a cultural examination of place through the passing of time that wouldn’t have been possible otherwise. In a way, this reminds me of the format of Octavia Butler’s, Kindred; where time travel is similarly used to examine cultural changes over time. Mortimer truly digs deep into society and how the workings of that change over time due to things like increased wealth, better living conditions, changes to transportation and the invention of more powerful and devastating weaponry. A phrase repeated throughout the work, ‘homo homini daemon’ – man is devil to man, speaks to the heart of some of the issues taken up in this work, that seems just as much a philosophical treatise as a work of fiction. A couple of my favorite lines being, “The man who has no knowledge of the past has no wisdom” and “…you must see what you mean to others to know your true worth.” The last paragraph practically made my heart explode as the narrative came to its resounding conclusion. I am so glad that I had the opportunity to read this book – thank you to Pegasus Books for providing me with a copy. I would definitely recommend this book to history lovers of all kinds! Next > Happy December 1st!! !